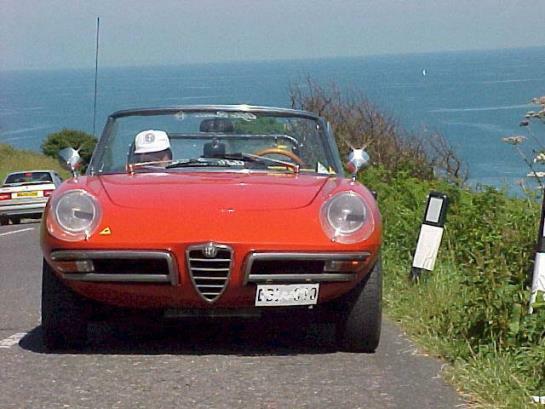 In 1971 the Spider got the sweet 2-liter Alfa engine which it retains today. The name was now Spider 2000. UK imports of the Spider ceased in 1977 while most production was diverted to the insatiable American market, besotted with images of Dustin Hoffman behind the wheel in The Graduate. However, in the UK Bell & Colvill began to import Spiders from 1983 onwards, converting cars to right-hand drive. As of July 1990, the Spider once again was available direct from Alfa Romeo. The Spider has been a classic hit for several years. The combination of the syllables in "Alfa Romeo", coupled with the rarity of any affordable open sports cars from this era, makes the Spider irresistible. The problem stems from Alfa Romeo's rather feeble attempts at rust prevention. Pininfarina assembled the bodies before given a primer coat, so that areas unexposed to the spraying machinery were left bare and unprotected. Keeping a Spider garaged or car covered always pays off.. Just storing it outside and not driven it will sooner or later cause rust, electrical problems etc. Water pools and muck and everything, you know what I mean. . . Trouble ahead if so! The best advice when checking an Alfa is therefore; make sure that the bodywork is sound. Go to the service-station and lift the car so you can examine it from every angle. Mechanically, any problem can be sorted out fairly simply, but a rotten body is a lousy project. The bottom six inches of the bodywork should be thoroughly checked. Often, small signs of corrosion on the outside of the car might indicate serious trouble on inner panels. The inner sills are structural on the Spider body, and corrode very badly. If they are damaged, the remedial work is expensive, as the wings have to be chopped and new pieces fabricated when the inner sills are replaced. The cost of those might be high. Check www.highwoodalfa.com for panels and parts. It is important to control all around the sill areas. Do not forget the wheelarches, which sometimes are notorious water-traps, the entire floor including the boot, plus the front cross-member underneath the radiator. Watch out for patch-up jobs using bridging pieces of metal to disguise more serious corrosion elsewhere. Very poor Spiders can be made to look great cosmetically, and fetch a high price on the strength of that. But still, it's the underneath that counts. What may look like superficial rust bubbling could mean that the inner section is badly corroded. Peeling back the rubber mats at the door base can reveal a rotten inner sill wall. Check seat runners, they can indicate a rotting floor too. On Duetto and Spiders, the Round-tail rear tends to be a vulnerable to attacs of the orange enemy, rust. Replacement panels are available, but might make a big hole in your wallet. Sometimes, the rear wings are close to impossible to find, but don't give up. Try the vendors on the web.